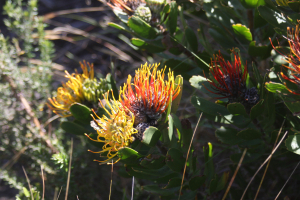 The Conservancy's irreplaceable Fynbos is rapidly disappearing due to urbanization, the paving of drives and gardens, and the encroachment of our natural green areas. The Dana Bay Conservancy is presently compiling a pocket booklet which will assist in educating, protecting and creating an awareness of our unique ecosystems. Endemic plants and flowers can be easily identified through the beautiful color thumbprint photo's with their botanical names. Residents and visitors may then research additional information about our flora.